Soup makes for an economical meal, especially if you make a large batch and store portions for future meals. Various soups will keep for two or three days in the refrigerator and for over two months in the freezer, saving you the trouble of dirtying up another set of cookware. 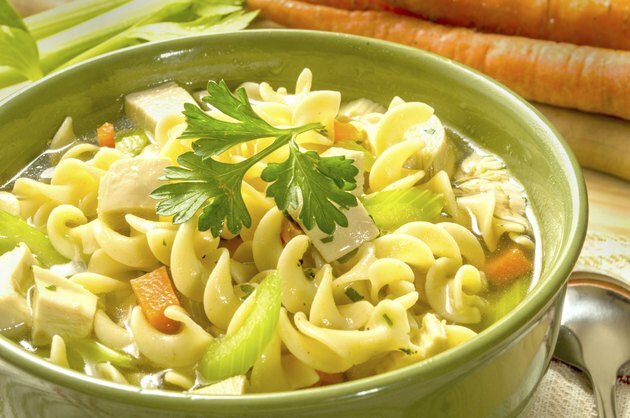 Reheating soup is simple; the main concern lies in getting it to just the right temperature to satisfy both food safety concerns and your tastebuds. Pour the soup into a pot large enough to prevent any boiling liquid from boiling over its sides. If the soup fills the pot, use a larger pot. Add extra water, especially if the soup contains pasta or rice, as these will have soaked up a lot of the extra soup liquid during storage in the refrigerator. Good Housekeeping magazine recommends adding between 1/4 and 1/2 cup water. Turn the heat up to at least medium if the soup is not frozen. If you know that the pan can handle it and the soup is mostly broth, you can use high heat. If the soup is frozen, add the water and heat on low for a few minutes until the soup melts. Turn up the heat after that. Wait for the soup to boil. Stir regularly to prevent food from sticking to the bottom of the pot. Let the soup boil for at least one minute. Turn the heat down to medium-low and let the soup simmer for a few minutes. Turn off the heat and remove the pot from the hot burner; the metal will remain hot for a while even after you turn off the heat. Insert a food thermometer into the soup, but do not touch the bottom or the sides of the pan. The temperature should read at least 165 degrees Fahrenheit. If the soup contains chunks of food, insert the thermometer into the chunks. Lift the chunk from the bottom of the pot if needed. Everything in the pot needs to be at least 165 degrees. Heat the soup some more if needed. Pour the soup into a microwave-safe container that has a lot of room at the top. Soup can boil over even in a microwave. Place a microwave-safe lid or plastic wrap on top of the container, leaving a small opening at the side as a vent. Heat the soup on high for 20 to 30 seconds. Open the microwave's door and stir the soup. Heat the soup again for another 30 seconds. Repeat alternating heating and stirring until the center of the soup is at least 165 degrees Fahrenheit. Again, use the food thermometer to measure both the broth and chunks of food. Weight Watchers recommends microwaving on high for 60 seconds per cup of liquid, and states that this will work for frozen soups as well. Good Housekeeping magazine, however, recommends initially defrosting soup at 30 percent power until you can stir it. All leftovers, including soup, should be reheated until a thermometer stuck into the middle of the container of soup reads at least 165 degrees Fahrenheit. Don’t reheat leftover soup more than once. If you’re not very hungry, reheat only what you know you’ll eat. The time it takes for a soup to reheat will vary depending on the ingredients. Don’t rely just on timing; check the temperature before you eat it.